As students tell other students about the plight of the people in the Azawak, they are reaching hearts that want to help. Each student speaking out makes the world a better place. Hearts transforming hearts: the world changes. On February 20, 2007, upper elementary and middle school students at The Barrie School saw a heartfelt presentation from three seventh graders and the Assistant Director from the Oneness-Family School in Chevy Chase, Maryland on the drought conditions in the Azawak, an area of Niger in Africa. Debbie Kahn along with students Gabrielle Espina, Katharina Kronsteiner, and Louise Eriksson spoke to an attentive audience of fourth through eighth graders that day. Even before Barrie teachers presented their students with an opportunity for a response to this dilemma, one Barrie student decided to take action. Sophie Klein, a fifth grader in Sara and Karen’s UE class, began to go door to door in her father’s neighborhood with her small notebook of facts about Amman Imman that were handwritten in pencil. Sophie dutifully and eloquently presented the plight of these people. Amman Imman means “Water is life” in the Tuareg language. Sophie spoke with each neighbor who greeted her about the drought conditions that exist in this area, the high rate of death and disease that it causes, and the wells that need to be dug to bring relief. 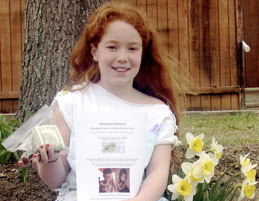 In one month’s time, Sophie raised sixty-three dollars to help build wells in Africa. One student making a difference. One student taking her feelings about a cause and moving forward. Maria Montessori said, “Follow the Child.” Sophie, we congratulate you for your dedication to this cause and the actions you took to make a difference in the world. We will be right behind you! We will follow your example! The thread of inspiration continues to spread, student to student: the Barrie students will be presenting Amman Imman at the Evergreen School on Tuesday. I go to the Barrie School and my mom saw this in a resterant and i think it is a wonderful idea so i am going to donate some money!!!! !